Jeep is launching the 2020 Jeep Gladiator this year, so it makes sense that all of the 2019 Easter Jeep Safari concepts are trucks. Many of them are extremely cool, but one concept rises to the top: The Jeep M-715 Five-Quarter. It’s a hellcat-powered brute with military roots, so if you love Jeeps or trucks or both, grab some ice cubes, because your mind is about to melt. The Kaiser Jeep M-715 of the late 1960s was the original convertible Jeep pickup (unless a flatfender without a rear bench counts), and in the annals of off-road history, it sits firmly among the greatest trucks ever thanks to its huge fender flares, an essentially vertical folding windshield, a rag top, sheetmetal similar to that of the gorgeous Jeep Gladiator upon which it is based, a 24-volt electrical system, blackout lights, beefy solid axles, huge 34-inch tires, tons of ground clearance, a tough T98 four-speed manual with a short first gear—the list goes on. It’s an amazing Vietnam-era truck that took on the same role as the venerable Dodge trucks that served U.S. armed forces in World War II and in the Korean War, even if the Kaiser’s 3.8-liter 230 Overhead Cam “Tornado” inline six isn’t exactly known for its power or reliability. It’s called the Jeep M-715 Five-Quarter, with the last part of the name referencing the M-715's classification as a one and a quarter ton military truck. It may look quite similar to the standard M-715, but there’s not a whole lot of the stock vehicle left, aside from some of the frame (which has been beefed up and modified with provisions for a coil-sprung Dynatrac Pro-rock 60 in the front and a coil-sprung Pro-rock 80 out back), doors, windshield, and parts of the cab. The front fenders and hood are new, and are made of carbon fiber. Between those fenders and under that hood is a monstrous 700+ horsepower Supercharged 6.2-liter “Hellcrate” V8, which is mated to an old-school three-speed Chrysler 727 transmission and a “Rock-Trac” 241OR transfer case that you might find in a modern Wrangler Rubicon—all that spins 40-inch tires on 20-inch beadlock wheels. One thing I didn’t notice about the Five-Quarter concept until Jeep’s head of design Mark Allen pointed it out was the 3.5-inches shaved from the roof bows, and the shaved bit of the windshield frame (notice how there are no wipers above the windshield like there is on the stock M-715). The truck’s headlights are actually recessed within the modified JT Rubicon steel front bumper, Allen told journalists, while the lights taking the spot of the original headlights are off-road units “that will blind you.” The press release indicates that they are HIDs. There’s an orange LED taking the spot of the blackout lights that sat in the inner light housings (on civilian Jeep Gladiators of yore, these spots contained “pie pans”—just decorative metal covers). I think they’re a nice touch that add to the the truck’s menacing look. As for lighting out back, Jeep just modified the original style taillights, and they look wonderful. The back of the M-715 Five-Quarter concept is wacky. The six-foot box is completely custom, but loosely modeled after the original. It’s made largely of aluminum, with mesh openings in the bedsides and a tailgate that doesn’t open. That “tailgate” features the legendary old Jeep Gladiator font surrounded by open space that lets you view into the bed. The interior is lovely, aside from the modern seats that look a bit odd without headrests, and with their black plastic trim that—if we’re hones— has no place in a vintage truck like this one. I’m a big fan of carpeting in cars, but on a military truck like this one, bedliner is a good call. And the green color, which matches the accents in the wheel wells and elsewhere around the truck, is great. 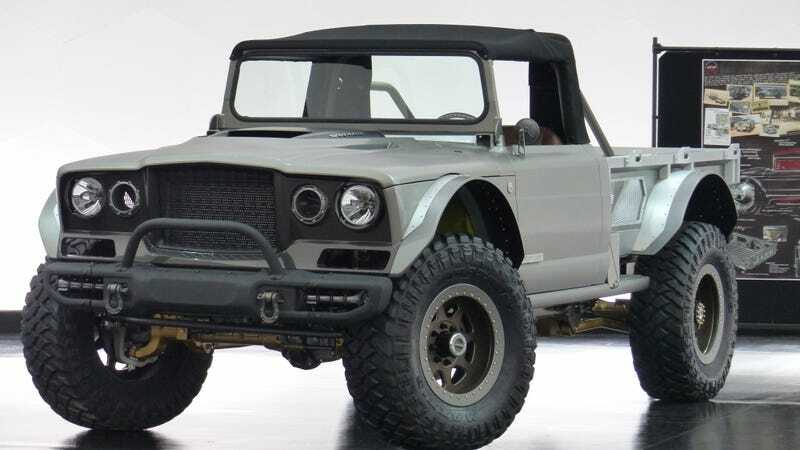 As is the case with all the great Easter Jeep Safari concept cars, there’s plenty of wackiness to be found on this truck—for example, there’s an 8-71 supercharger used as a center console to house the trans and transfer case shift levers. From a practical standpoint, it’s pretty hard to justify throwing a big hunk of metal into the cab instead of simply mounting the shifters to the floor and freeing up the space, but I get that this is all about fun. And how cool is the old headlight switch repurposed to activate lockers? And how about this lovely dash plaque? I always feel a bit strange when I see Jeep tearing up a perfectly good classic Jeep, but the result here speaks for itself. I’d prefer a bench seat, a tailgate that opens, maybe some windows, and probably a manual transmission, but even with those things missing, this machine is going to occupy my dreams for many months. Maybe years.